Keep up to date with Carl's news here. A delightfully busy February with corporate functions and family shows, one again a successful show at London's Conjuring at the Court in West Ealing, prompted Russel Levinson the producer to send me this message "Hi Carl, Thanks again for a great act last night - you really got to the audience as a personality, it made a wonderful ending to what was a very strong show. Look forward to inviting you back to Conjuring at the Court!" Kind regards, Russel. Another year, where does the time go? A break in January after a busy December, and back to work in February, traditionally a quiet time of year for us entertainers, but encouragingly I have some nice functions coming up at the Madjeski Stadium in Reading, Berkshire for a new client. I have also been asked to come back to Conjuring at the Court in Ealing on the Thursday the 28th February, West London, my fifth appearance at the longest running magic comedy venue in the U.K.
Crikey! Here we are in December again. This year I've been half way round the world visiting four of the Hawaiian Islands, including the main island the day the Volcano started to blow, that's some impressive nature magic right there. My close-up show is very popular, fun and amazing. Imagine having your thoughts and actions predicted, or levitating a borrowed wedding ring, even removing a chaps glasses, without him noticing. This is the style of magic that I can perform and what you can expect at your event. It has a W-T-F aspect, it's captivating and amusing. Once again, another magician, Mark Cairns and I, worked for the Porche Owners Drives Club awards dinner in November, the 23rd Year for me. It was, as always, a fun black tie, posh frocks dinner & dance evening. I had the honour of returning to the Royal Military Academy, Sandhurst, for two events in December, two separate celebrations for Officers and families for their Christmas Parties. I like to think my shows live long in the memory, hopefully years after your event. Each event gets its own personal professional performance - and often will leave folks speechless. "The tricks are astonishing, from the opening card trick to the closing water/paper trick - this is great magic and fantastic entertainment. " Steve Garner-Jenkins. Goodness! I haven't written an update since November. Well, I'm delighted to say I've been busy with corporate events, trade shows and weddings, not to mention birthday parties and wedding anniversaries. I've been back to Norway to perform for my client in Oslo, it's nice to be asked back. Other corporate events have taken me to Claridge's in London, Penny Hill Park in Bagshot and The Crown Plaza in Stratford upon Avon where I literally bumped into Jeremy Corben, sorry mate. Wedding functions have taken me to a couple of new (to me) venues, the lovely Northbrook Park in Farnham Surrey, and The Aviator in Farnham Surrey. I have also had a return visit to perform my comedy cabaret show at London's longest Magic Show venue, Conjuring at the Court, at Drayton Court Hotel, West London, and had the privilege of being asked back to the Meet the Magic Circle shows, in Euston, central London. In addition, the start of the Christmas season is upon us, so the office Christmas parties have started and are continuing to book. Call me on 01235 850369 if you are considering entertainment for your office Christmas party. Corporate events, including trade shows for Helitech International, Helicopter Expo & Conference ExCeL London and The National Franchise Exhibition at NEC, Birmingham a two-day exhibition for people looking at franchises, my role was to attract footfall to my clients stand. September is always busy month for weddings, (my wife and I got married in September, the weather is usually just right for some reason) five this month, from Chippenham to the borders of Wales. Mix n mingle magic is brilliant for a wedding party, a good magician will be able to entertain guests, break the ice for strangers and bring them together, particularly useful during the photo session if you have a lot of guests, the magician can keep people entertained in between photo sessions. I did another show at the world-famous Magic Circle, I think it was the twentieth one this time round, these shows are called Meet the Magic Circle, and you can buy tickets and see several performers in one night at the unique Magic Circle HQ. Just google it for tickets. I also had a holiday, a week in France including taking part in the Run Disney Half Marathon event, great fun, have google of that too if you've got a minute. Great fun with the staff at EasyJet with graduate welcoming event at the end of July performing mix n mingle magic and at the beginning of August, the Cosgrove Park, near Milton Keynes Caravan Club Summer show was great fun, over 100 guests turned up to see the comedy cabaret show, I very much look forward to doing that again next year. It was nice to hear form my clients at the Porsche Owners Drivers Club again a couple of weeks ago, they have once again booked me for their annual awards dinner, the 23rd year in a row. I was hired to entertain at Jim's 70th Birthday party at Luton Hoo Hotel, near Luton in Bedfordshire. It was a family party with about five children and 40 adults, as you can see from the email message, the show went very well. "Carl, you were brilliant. Thank you so much for giving us all such a big laugh at Luton Hoo. It was supposed to have been just for the children, but the adults all stayed in, and given it had been a stressful time for the family, having a great laugh out loud together was exactly what we needed. The children thought it was a riot, but you kept them sensibly under control, and we appreciated the warnings you gave them about trying to repeat some of the tricks themselves. Look forward to the next time! Jim"
Have you got a a significant birthday or anniversary coming up with a family party? The you might want to consider a funny comedy magic show to entertain all the family, give me a call or send me an email to make enquiries. I have entertained at 30th, 40th, 50th, 60th, 70th and 80th and even 100th birthday parties as well as significant wedding anniversaries and christenings. At the end of March I had very successful show at Conjuring at the Court, a good turnout of new and regular show goers watched four acts and I was fortunate enough to be asked to headline the show on this occasion. It's a great show and is if held on the last Thursday of every month, go along it's a great show. Also two shows at the world famous Magic Circle in London, at an event called Meet The Magic Circle, public can buy tickets and see a eight brilliant entertaining magicians, another great night out, check out the reviews on Trip adviser. I can't believe my last update was in November 2016, we are almost a quarter through 2017. I'm still continuing to entertain at private events, wedding and conferences, but coming along to the two shows listed above will give you a chance to see me in action before booking me. Many thanks for your fine work at the weekend. As always, the guests all enjoy your act and I think that you being there with a colleague - Ed in this case - adds variety and allows you both to ensure all tables and guests get to see your performance. I am uploading pics today and I will send you a link. If there is anything you want, let me know and I will mail it to you. I have attached a couple that show you. Also, this in last three months you would've seen me performing my cabaret style magic at the world-famous Magic Circle. The most prestigious magic club in the world, where people from all around the world come and see magicians perform some great magic. Another client rehired me again in October to entertain the guests at his company dinner in Peterborough, the PPV group were celebrating 20 years in business and the owner though it might fun to celebrate with a dinner and some entertainment, this was the 3rd time I have this client has used my services. A busy June, July and August with wedding parties, family BBQ's, Garden Parties and Pro-Celebrity Cricket matches. Here are some testimonials from some clients from the summer. I will request that payment before the end of the month. Hello Carl, Just a note of thanks, for your very entertaining show, Saturday 7th July. Everyone was amazed and delighted with the magic and balloon sculptures, and my grandson is still baffled as to how the cloth got into his sock! If you would like a recommendation or one added to a website, let me know and I'll accommodate. Hi Carl, Sorry for this being bit late but wanted to say again: Thank you so much for attending Jamie's party. Everyone loved it! Witty, funny and controlled in perfect balance. All best, I may be in contact soon for a quote for our wedding! I had two lovely email messages today from separate clients for whom I performed shows this weekend, one for a 70th Birthday party, and another for an 80th Party. Just a short message to say what a truly enjoyable performance you gave Jim and to us all on a special day. To see dad smile so much was just what we wanted and what's more, we shall pass your name on to all our friends and contacts. Your Tommy Cooper impression was testament to the man and I'm sure that a fez would be the icing on the cake. A very big thank you for putting on such a great magic show on Saturday. You managed to wow not only the children but also the parents, as well as the wrinklies! Millie was so impressed that she has decided that she wants to become a magician! And William couldn't stop telling me the next day how amazing it was that he had managed to magic up 2 juggling balls! All in all, a great finale to a lovely afternoon. Many thanks again. Another show at the London's famous Conjuring at the Court in March, sharing the 'billing' with Steve Rawlings, the brilliant Barat Patel and the smooth Richard Pinner to a full to capacity house, London's longest running monthly magic and comedy show was alive with laughter and surprises. My third time here and I had a great time, performing my cup n ball trick, water into newspaper as well as one or two of my other comedy magic effects. Here is a video link to my first performance there in 2014, it's about 20 minutes long, and the quality is a bit shaky but you might enjoy what I get up to. Here is a selection of comments from the back of the raffle tickets that are sold at The Conjuring at Court, a show I was guest at last month - unedited - from which we can infer that A) they really enjoyed the show, and B) none are likely to become professional gag writers! What did Snow White say when the chemist lost her photo film reel? Some day my prints will come. I used to be a trapeze artist, then I was let go. Still hurts. Great! Very funny jokes. Amazing magic. What goes he he bonk? A man laughing his head off. The shows are getting better & better. Always look forward to them. I also did a great family show at the Northwood Synagogue, Northwood in Middlesex, sixty folks made up of parents, grandparents, children and other members. They really did enjoy my 45 minute cabaret magic act. A repeat booking for adults only cabaret show at the Littlebury Hotel in Bicester, Oxfordshire in march for David Rose's wedding anniversary great to see some familiar faces again. Whether its weddings, anniversaries, birthday parties you are celebrating I have a show to suit your event, telephone me now let's see what I can do for you. After the rush of the Christmas party season it quietens down in January, having said that I have had a steady work flow of family shows and Close up magic, including one in the Great Hall Brockhurst House School near Newbury. A building built originally as a house for the Palmer family of Huntley and Palmer biscuit fame. Huntley & Palmers was a British firm of biscuit makers originally based in Reading, Berkshire. The building was like walking into Hogwarts Wizard School, a fantastic setting for a magic show. I also performed some magic for my friends at the Penrose club in Feltham, Middlesex this is a social centre for people with learning difficulties, a great fun night with other entertainers joining in. It's now time to start thinking about booking your magical entertainment for your wedding party, telephone me now for more information on how I can help you make your wedding great fun for you and your guests. My Goodness, where has the time gone? Three busy months entertaining folks all over the South of England. Close up magic for weddings in Surrey, Wiltshire and Oxfordshire, a Trade Show at the NEC in Birmingham in October including a Halloween party in the officer's mess at The Edward Brookes barracks in Abingdon. In November I worked again for the Porsche Owners Drivers club annual awards event for the 20th Year in a row, a mix n mingle magic plus cabaret for an old friend Steve Critchley in Surrey for his Telecoms Plus clients, then a week later I visited Haverhill in Suffolk to entertain the guests at Rod George's 70th Birthday party for an hour and another family Celebration in Newbury in Berkshire for the guests of Celia Saunders. December is just busy, shows for Schools in Oxfordshire, Berkshire and Wiltshire, then Roman's Estate agents Christmas Party at Ascot Racecourses venue with two of my magical colleagues Richard and Rajan, then a visit to the West End to entertain Deloitte's guests at the Ice Bar London and another two Family Magic shows at the Headquarters of William's F1 Racing in Grove, Oxfordshire for the second time. The fantastic weather we had in September saw me perform at various events and garden parties this month. Two return visits this month to Wormsley Cricket ground to entertain the folks during lunch with some table top magic and later a family magic show for those not interested in the game between the Sir John Paul Getty 11 and the guest team. This must be about the 20th event I have attended for them, I love going there, the grounds are stunning and for some reason the weather is always good. Later in September I did some mix n mingle magic for the guests of Mr & Mrs Hester in Stone, near Aylesbury, it was a lovely summer party at their delightful "chocolate box" thatched cottage. They all seemed to enjoy that magical antics, as did I even though I had ran the Pangbourne 10k race earlier in the day. On the 19th September I was asked to provide close-up mix n mingle magic for the end of season captains event at the Weybridge Lawn Tennis club in St Georges Hill, Weybridge, a great couple of hours with some really friendly folks, they finished off their evening with an Abba tribute band. To finish off the month I did another garden party with my Comedy Cabaret show for a joint Birthday Party of Holly who was 30 and her son Matthew who turned 5, lots of giggle with the kids and adults, they really did seem to enjoy the show. The last three months seem to have whizzed past, and I have a selection of mainly family events to write about. Another visit to Beaumont Nursing Home in Oxford to entertain the residents for a picnic party, about 50 guests all in their 70's and older, they seem to like the magic there, it's my fourth visit. A 50th wedding anniversary In Brill, Buckinghamshire 50 guests all enjoying a lovely and very warm night out, I performed my 45 minute magical cabaret show for them and I received some nice feedback from Viv and Richard, the hosts "Good Evening Carl, We are really pleased to let you know that we have just received confirmation from Alzheimer`s Research UK that donations in connection with our special evening raised £625.00. Thank you for helping to make our do such a success. With every good wishes, Vivien and Richard"
One of my past clients called me up again to entertain at his father 70th Birthday party at The Bell, Great North Road, Stilton, Peterborough, this time it was to perform magic around the tables in the restaurant, to a mixed age group of Alan, the birthday boys guests, the youngest was about 12 the oldest 75, a really lovely family event. An unusual event at Cumberland Lodge, The Great Park, Windsor, Berkshire; family magic shows interspersed with a jazz band and a performance of a new play by Nic Bicat. The Earth Trust , Little Wittenham, Abingdon, Oxfordshire, was the venue for Maria and Pete's wedding, performing mix n mingle magic at a picnic aa the bottom of Wittenham Clumps, great fun though you had to watch were you were standing with all the cows milling around the guests! On July 23rd I performed some magic for my friends at a fundraiser for the Penrose Club, a social club for adults with special needs, resident in the boroughs of Spelthorne, Runnymede and surrounding areas. 80 guests attended the fundraiser at the Red Lion Pub in Thorpe, Nr. Chertsey in Surrey. It was a lovely evening and over £800.00 was raised for the club. And lastly for now, my third Visit to Patrick Hughes' home for some family magic for his work colleagues, family and friends in the garden of his lovely home in Hemel Hempstead, it was great seeing them all again, a delightful group of folks and a sheer pleasure to entertain. A busy month with magic shows for families and corporates in London, Oxfordshire, Berkshire. Richard Pinner, Chris Hare, Ed Francis and myself put on a great show at Dicicot Civic Hall on the 29th May, around 60 people came a long and enjoyed the magic, mentalism and comedy, We also had two great guests Ace and Sky two great kids who gave us a musical interlude. Another appearance at Conjuring at the Court in Ealing in West London, appearing on stage with one of magical heroes Graham P Jolley one of the few magicians who fooled Penn & Teller on ITV's Fool Us. Here is a review of the show y Jean Purdy, her review of my performance is at the end. This month's show was compered by our own Roger Dunlop who did the job in fine flair and total confidence. His Pom Pom sticks has a new and interesting slant. All shows need a great opening and we were treated to a top act from New Orleans. A prize winning comedy magician with a Cajun accent who has been wowing audiences across the country. Michael Dardant, a very experienced performer who provided belly laughs from the word go! His easy going manner and professional approach went down well with everyone at `The Court` His magic and `bits of business`, too many to mention, were a joy. His card handling and cigarette routine were simple but so entertaining. You should have been there! Wez Zaharuk, a Canadian performer was paying a return visit. He was so popular the last time he visited us, that he was bought back to drive us mad! This crazy man knows every move and comedy line to have you in tears of laughter. The chap in the second row just didn't know what had hit him when Wez produced a leaf blower with a massive roll of paper attached. As he switched it on the paper just flew across the front row and completely covered the guy in the second row! This continued for about thirty seconds which does not sound a lot but with this powerful machine it shifted enough paper to totally cover the poor lad! How the audience laughed. You should have been there. Roger entertained us with some lovely routines including his squared circle and prize giving cards. I am not writing this in order of appearance as you will see, but there is a reason for this. All will be revealed later. Stephen Barry and Russell Levinson always bring us the best in entertainment and tonight was no exception. Once again they managed to capture a top line performer in Graham P Jolley. Graham is a superior entertainer with so many years of experience. His brilliant patter is so fast that you couldn't sit in the audience and write it down. (You dare try)! The remarks from those around me proved that we were watching a master! It was AAK all the way but we were happy to see the expert at work. He obviously finished with the `billiard ball` prediction which had the muggles in the crowd gasping. You should have been there. I have saved my favourite of the evening for last. Carl Pettman. I have known Carl for many, many years and I am amazed at how he has changed over time. I love his delivery. It's in a class of its own and the audience love it. As for style, he is the ultimate professional in presentation and always looks so smart. He could take this act anywhere. (DON'T YOU EVER DARE DO BRITANS GOT TALENT). His magic is well honed and his cups and balls, so special. I don't know if he ever gets stage fright but he certainly looks relaxed throughout. I could feel the spectator's reaction as he moved through the act. His comedy/ magic will always be welcomed at `The Court`. YOU SHOULD HAVE BEEN THERE. The next show is on Thursday 25th of June. The line-up is TERRY HERBERT*.JON ALLEN* NICK EINHORN* AND JAMMES GARBIBO *COMPERE* RUSSELL LEVINSON. TICKETS@CONJURINGATTHECOURT.COM Book early for discount. I'm pleased to report that the Magic Show at The Harlington Theatre in Fleet went very well. A good turn out and the feedback has been great, you can see some photos on the Harlington face book page Click HERE for photos, taken by Amy . It's been a busy month with family anniversary shows, wedding parties, including a fun wedding in Wingham, near Canterbury, Kent where they also had a great look-a-like Gordon Ramsey played by Martin Jordan, quite uncanny. After a comparatively quiet time in January after the Christmas party mayhem I had a busy February performing magic at events for clients in London, Oxfordshire, Surrey and Hampshire including two wedding parties and a family function for a 70th birthday party in Basingstoke, and 65th party in Bicester. One of the highlights for me was performing mathematical magic effects for a company called Magical Maths at the National Franchise show at the Birmingham NEC. The job was to attract potential clients to the company's stand so that they could talk to guests about their offer, it was great fun and something a little different for me. Feedback was very good from the client and the visitors. The first two weeks of March, was holiday time, two weeks in the lovely region of Stellenbosch in South Africa. I'm back now and I am looking forward to more cabaret magic shows coming up, in particular two public shows, The Magicians at the Harlington theatre in Fleet Hampshire on the 10th April Click HERE for HARLINGTON tickets and a return to the very popular Conjuring at the Court in Ealing, London Click HERE for CONJURING AT THE COURT tickets on the 28th May. Tickets available from the box offices. It would be great to see you there. A remarkably busy December with shows for corporate and private clients, which included Christmas Parties for Williams F1, Roman's Estate Agents at Ascot Race Course, Capstick Solicitors at the Criterion Restaurant in Piccadilly, London, The Fox Pub In Farnborough and Woking Football Club just to mentions a few. I thoroughly enjoyed myself and the feedback I received from my clients was all very positive. Magic events coming up this year so far are private functions for various weddings, civil partnership, a christening, a company bar-b-q and some fetes. Mix n mingle magicians and add a bit of fun to your wedding, party or function please call me to discuss your event and I'll be delighted to help and advise you get the best out of your party. 01235 850369 or fill in the enquiry form. I've moved! My new telephone number is 01234 850369. I now live in South Oxfordshire, near Didcot having moved from North Oxfordshire near Bicester. A busy couple of months what with moving house, fitting in work and a birthday to celebrate as well. Close up magic work has been busy in the corporate world with magic for clients Including DHL, Esso and Mars Confectionery. I also entered another competition this year, at the Zodiac Magic Society, one of the oldest magic clubs in the UK, based in Ealing, West London. The competition was for stage magic; performing magic in front of an audience who are seated. 10 contestants to perform 10 minute sets each. Guess who won, go on guess. Yes me that's who, I was delighted! I have only ever entered two competitions, I came second in the first one. Good result I think. More work coming in for November and December another gig for the Porsche Owners Drivers Club, Williams F1 racing team, Morrison's and Romans Estate agent thus far. Wow! What a busy month with magic at the end of August through to September. I took part in a lovely show again with magicians Martin Cox and Paul Read in Bishops Stortford in "Magic at The Half Moon" it's like a comedy club but for fans of magic and comedy. Read about it here: http://tjs-ents.co.uk/halfmoommagic/. I was a pleasure to work again (twice this month) for The Big Group at their corporate cricket matches at the grounds of Wormsley near Stokenchurch, Oxfordshire. Entertaining the guests at lunch and tea, and for those who are there that don't watch cricket. It was a pleasure to see Sir Michael Parkinson again, and meet Brian Lara. Two weddings this month, one in Sundridge Park Manor, Willoughby Lane, Bromley, Kent, working with a great Toastmaster/Master of Ceremonies Ron Wilson, who was great fun and very professional: www.ronwilson4u.com . My 19th magic booking for Porsche Owners Drivers Club awards dinner in Brands Hatch, Kent. I performed magic at the reception, walking about performing mini miracle under the eyes of guests whilst they were getting together before dinner. Then when dinner was called I went around the tables entertaining guests with magic with items from the tables, bending spoons, floating knives, making serviettes vanish, card tricks, rope tricks and so on. It was a large function, with about 250 guests so my friend and colleague Ed Francis joined me on magical duties. We performed magic for racing driver Derek Reginald Bell MBE, the directors of Porsche, and all the guests of the drivers club, a very enjoyable evening all round. I have been a bit tardy in keeping up to date with the news page on my site! So, a quick catch up and update. Since March I have been busy performing my magic acts; Close-Up, Cabaret & Family shows in Oxfordshire, London, Berkshire, Wiltshire and Northamptonshire to name a few. Performing magic for Wedding Parties, Old Folks Homes (my oldest member of audience to date is now 103 years old), Wedding Anniversaries, 40th, 50th and 60th Birthday parties and various Fetes and Garden Parties through-out this summer, all in all I'm pleased to say I am keeping very busy. If you have a function coming up and you would like your guests to be entertained with some clever and amusing magic give me call or email now and let us have a chat about your requirements. Sunday I performed my one hour magic show for Brian Westbury's 60th birthday party at the Littlebury Hotel in Bicester, I had mixed ages from 3 years old to nearly 80 in the audience! Everyone had a good time and even some folks who were not amongst the invited guests were watching the show from the hallway. Proof if proof is needed that everyone enjoys a good show and likes to laugh. Having spent last (very long) weekend at the biggest Magic Convention in the world; The Blackpool Magic Convention, I'm back with a renewed vigour and some interesting new magical effects to learn and perform. I must confess to having had a brilliant time in Blackpool, I got to see some great magic acts, met some new people, and reconnected with some old friends. I even fooled another Magician with one of my effects; it's nice when that happens. I had a great time with the Family of Mrs A Verma at Old Windsor memorial hall, Berkshire on Sunday. A family party at which I performed my one hour cabaret magic show. The audience consisted of adults and children; the youngest was five and the oldest eighty five! I real lively mixed age group, lots of laughter and "what the heck" exclamations, the best of which came at the end of the party where a chap offered to pay me money to tell him how to one of my effects. I politely declined quoting him The Magic Circle motto "indocilis privata loqui", roughly translated as "not apt to disclose secrets"
I had this email from the client this week: "Dear Carl, Thanks for making Manav's birthday so much fun, we all truly had a great time and you were the topic of conversation all last week !! I will be sure to recommend you and hope to see you again soon. Kind regards, Alka Verma "
If you would like to learn some magic tricks and effect, and have a genuine interest in learning, I can offer you private magic lessons. Contact me now for details. Traditionally a quieter month after the busyness of Christmas Parties in December, however I did a few family parties in January, in Warwickshire, Oxfordshire, Northamptonshire and Berkshire, I also performed at the Zodiac Magical society which is one of the oldest magic clubs in the UK. Amongst various private engagements coming up in February, I'm looking forward to performing at a public event: Conjuring at the Court in Ealing, a rare opportunity for me to perform my cabaret magic for members of the public as opposed to being hired for a specific function. Tickets are available here. http://www.conjuringatthecourt.com/ come and say hello if you come along. Contact me via my contact page if you would like to discuss entertainment for your party or function. Now is the time to booking entertainers for Summer Balls, Charity Functions, Summer Company Picnics and Exhibitions. December is very busy time for entertainers, with company Christmas parties, school events, Christmas lunches and so on. My magic work took me all over the place this December, with magic shows for IBM in Warwickshire, Watford Hospital Christmas party, and various private party functions in Cheltenham, Oxford, Bicester, Slough, Swindon and back once again to the Madjeski Stadium hotel and conference centre in Reading. It's been a while since my last post; I have been very busy I am delighted to report. In November amongst the many family parties, and cooperate magic shows, I entered a Close- Up magic competition at one of the magic clubs I belong to. There were ten contestants who all had to perform close up magic amongst guests who were not magicians and judges who are magicians and performers. It was the first competition I had entered in over 25 years of being a professional performer. I am delighted to tell you that I was the runner up, I was awarded a nice medal and I have to tell you I am chuffed to bits with it. 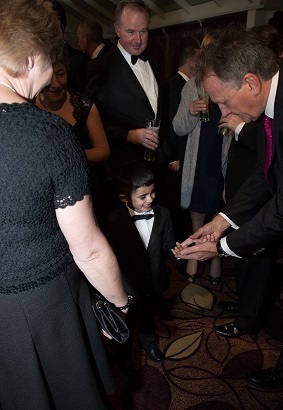 So far this month, a performance of close-up magic entertaining the private clients for a firm of solicitors at the Bicester Golf and Country Club in Oxfordshire and performing magic in the children's wards of three hospitals, Stoke Mandeville Aylesbury, Watford and Stanmore in Middlesex. Brethertons LLP were the hosts of a corporate event in at the golf club in Bicester, their instructions to me were to help the clients feel comfortable and mix & mingle with each other. I did just that by engaging the client's guests with magic performances that were designed to engage everyone and get people talking, which worked brilliantly and the guests had a lot fun. 40, 50th and 60th magical birthday parties have been very popular this year so far, along with performing magic for wedding functions throughout the summer. Travels have taken me all over the south of England this year, including La Taverna Italian Restaurant, Windsor, Blenheim Gate, Oxfordshire, Golf Club in Kenilworth, three wedding functions in one venue at Latimer Hotel in Chesham, Buckinghamshire. Family shows for christening parties have been popular this year, performing magic cabaret shows for mixed audiences for the entire family for ages 4 up to really really old. Magic for corporate events have also been busy this year, up from 2012 which is encouraging news, I have already taken bookings to perform magic at various company events for December 2013. Contact me now if you are hosting a Christmas party for clients or staff this year, I will provide some great fun magical entertainment to get the party off to great start. This year aside from being very busy with my Magic work I have been cycling to keep fit and for recreation, over 3.5 thousand miles this year, including cycling around the Five Boro's of New York on closed roads, The Ride London-Surrey 100 on closed roads which followed the route of the 2012 Olympic cycle road race, through London, Kensington. Richmond, Kingston, Walton on Thames, Weybridge, Byfleet, Woking, Ripley, Guildford, Dorking, Leatherhead, Esher, Putney and back into London finishing along the Mall near Buckingham Palace, I also rode round Paris at night, in the very early hours of the morning riding up and down the Champs-Élysées and around the Arc de Triomphe...twice! My only excuse is I've been rather busy I'm pleased to say. Christmas seems such a long time ago, and December was a very busy month, performing close up mix n mingle magic and table magic for corporate functions for Gillette, BT & Virgin Media and Johnson & Johnson all at the Madjeski Stadium Conference Centre in Reading. Great Entertainment provided by Emsco www.emsco.co.uk including myself, and Elvis look - alike and sound - alike, complete with Vegas Dancers, Band, as well as a Jazz Quartet, Casino, Balloon Modeller, and my good friend David Lewis the Caricaturist. www.davidlewiscartoons.com. I also did several shows for Schools, and three magic shows for the young adults at the Mencap day centre in Andover www.andovermencap.org, as well as some private Christmas parties in some very nice homes, this year was a very busy year and rounded off with a great family party on New Year's Eve. January is traditionally a quiet month for us entertainers; however I did some nice family shows, a 60th birthday party in Oxford and a Sales Conference dinner for an American company called Mavenir http://www.mavenir.com/ at La Taverna Italian Restaurant in Windsor http://www.lataverna.co.uk. And finished off with a late Christmas / New Year party for the staff of Ocado in Coventry. So far February is bucking the trend of being the quietest month of the year and turning into a normal month; I have performed magic at a Christening Party, two Weddings, and at The Avenue Special School. Tilehurst, Reading. Events coming in for the year so far Magic for Weddings, Conferences, and a Magic Lesson bought for someone's 60th Birthday party, but that is a surprise so I can't say any more about it! It's nearly Christmas! Just 42 days to go at the time of writing! It only seems like last week I was on holiday in the South of France in September. October was a very busy magical month this year, one of the busiest I've had with two, three day exhibition events, one at NEC Birmingham and one at Kensington Olympia exhibition halls. I was hired to entertain and draw guests to my client, Solartech's Stand. Both exhibitions were very busy and successful I am pleased to report. Other events since August include, wedding parties at the Oxfordshire Inn Hotel, Heathfield Village, Bletchingdon, Oxford, another at Bird In Hand, Whiteoak Green, Hailey, Witney, Oxfordshire and The College Nurseries in Main Road North Burlingham, Norwich. All of these wedding were quite small family only events, and all rather nice and friendly. An unusual event for Bridges Estate Agents new branch opening In Fleet in Hampshire, Performing mix n mingle, close up magic. I also had the privilege of working again for the Awards Ceremony for the Porche Drivers Club of Great Britain, my 16th year at this event! Coming up in November I have magic to perform at three 40th Birthday parties and a wedding anniversary party, Close-Up magic at Corporate Christmas parties for Gillette, Virgin Media, BT, all at the Madjeski Football stadium conference centre in Reading, Berkshire and IBM, Warwickshire in December. The end of July and August has been busy with weddings, company picnics and summer fetes. At the end of July on the 29th, I entertained the staff and guests at Belron International in Egham, Surrey at the their company fun day, then later the same day I entertained the Bride, Groom and guests at a small charming wedding party at Donnington Hotel Golf and Spa in Newbury, Berkshire. On Saturday the 30th I was hired by Mrs Hawes to come and perform mix n mingle magic at a family Picnic & Barbeque to celebrate the 40th birthday of her husband Peter. With 200 guests of all ages, it was a bit of a challenge, but everyone was in good humour and we all had a great time. One unusual booking in August was to teach some children magic at a Holiday club in Oxfordshire. I had two groups of 12 children for an hour each, and the task was to engage the kids and try to teach them one or two magic tricks that they could take away to perform on their friends and family. Both groups were enthusiastic and keen to learn, were very inquisitive and took up the challenge of learning magic tricks very well. An opportunity like this is not one I do very often and it was a refreshing change to teach magic tricks to children and was most gratifying. Hmm, the weather hasn't been great since my last news update has it? Oh well, the bad weather has been good for business with quite a few last minute bookings coming in for weddings and parties, and I have managed to fit in a Holiday too. This month I have been performing magic at Wormsley, near Stokenchurch, Buckinghamshire, again for a corporate event, entertained at three 40th birthday parties in three counties, Oxfordshire, Warwickshire and Buckinghamshire, and I have a wedding in Wiltshire to do later this week. Crikey! Summer is here, and just ten days to go until the summer solstice. I have had a busy spring I'm pleased to report, performing close up magic for wedding, civil ceremonies, wedding anniversaries and the usual mix of cooperate functions such as the Grand Designs Exhibition in London, and The Homebuilders Fair at the NEC in Birmingham. Some unusual venues so far this year included entertaining guests at a Show Home for Grand Metropolitan Homes near Milton Keynes, and I was showing close-up magic to guests at Wormsley Estate cricket pitch in-between games. Oh, and a wedding in the middle of field on a farm near Cheltenham, the bride and groom were very luck with the weather that day. In April I was once again back at Latimer Place near Chesham, Buckinghamshire where I had the pleasure if performing my mix n minge magic for Mr & Mrs Harper for the Golden wedding anniversary, the guests were a delight and we had a lot fun. In May, I also entertained the children and adults for a joint 40th birthday and Holy Communion BBQ for the Whelan family at Gorse Hill Hotel, Hook Heath Road, Woking, Surrey. We of course had the Diamond Jubilee events this year and in early June, I performed my Close-up Table Magic, Cabaret Magic and Family Magic shows at weddings, street parties, and village hall parties. As part of the Jubilee celebrations I will be performing my family magic show at a special Citizenship Ceremony in the Rose Garden of The Civic Offices, Euclid Street, Swindon. I'm looking forward to what should be a great event. Spring is on the way! I just love it when the days get longer. January and February are traditionally quieter months for magical entertainment. However I delighted to report that I still managed to perform my magic at some interesting functions In January, including two weddings and a 50th wedding anniversary. In February I performed at a family party for the seventh birthday party for a Philippine family. Seventh birthday parties are huge Philippine family events, there were over 200 people in the room! Great fun and great food! Another great gig was for Mercedes-Benz of Newbury for their yearly awards ceremony, their Oscars so to speak. I was asked to perform my close-up magic for the evening to break the ice and warm up the proceedings. I received some great reactions for the magic and the evening went very well. The rest of the year is looking very good, with bookings coming in for functions for weddings, trade shows and exhibitions (12 so far this year at the NEC, Olympia and Excel exhibition centres). With the Queens Diamond Jubilee coming up in June, I am almost fully booked for that weekend already. Please contact me if are looking to book a magician for a private function or corporate event. Give a call and we can have a chat about your event, I can tailor make magical effects especially for you. Happy New Year! December is now over and here we are in the middle of January already! I'm delighted to report that I had a busy December with magic bookings. I participated in entertaining at corporate events and family functions for Christmas parties, including a small private party for eight guests and a corporate Christmas function for 300 at the Madjeski Stadium Hotel in Reading, Berkshire. It was nice to catch up with my old chum David Lewis the caricaturist again at the same function; he was drawing and wowing the clients and I was entertaining them making them laugh with some clever magic. I also had the privilege of working for clients who had hired me in the past, so it was nice to be asked back and entertain at the Christmas Lunch for the Stilwell Partnership at the Red Lion in Horsell, and for Great Haseley Village Christmas party (for the eight time!). It was great to be asked to entertain some first time clients too, amongst them the guests for the Christmas Party of Fresh Direct, who had their party at a great venue called The Tithe Barn in Launton, near Bicester, Oxfordshire. I was asked also to find another magician for that same event, so Fresh Direct had two magicians, a great jazz band and the food there was fantastic. What a great party! I don't think I have had so many compliments on my choice of entertainment in the 6 or so years I have been in charge of this wonderful bunch of baby-boomers. Even Jean commented on how good you were which is compliment indeed. Thank you so much for coming to Steeple Aston and entertaining the group and may we all wish you a Happy Christmas and a Healthy New Year. Another month gone by since my last update! Today I'm performing my cabaret show for a group of retired folk at Steeple Aston Village Hall, I'll let you know how it goes later. I had a nice break away in November with the good lady, so not a lot to report on the Magic front, though I did perform my magic for a lovely party for a family who are leaving the country to go and live and work in Malaysia for two years. They got all the friends and family round and had a great send off, the mix n mingle magic was well received. I'm fully booked for December, though I do still have New Years Eve available if you are looking for a close-up magician for your event. 5th November, another trip down to Canterbury to entertain with some mix n mingle close, up magic at a fireworks party for the delightful family of Paul and Joy Roberts and guests. This is third time I have worked for them and it is always a pleasure to go there. This is a family that love a party and love to entertain. They still have a signed card on the ceiling that I magically put up there 3 years ago! Lots of magic work coming in for December, I still have some dates left, so telephone me if you would like some great close up, cabaret, party magic for your Christmas Party. Iron House Brasserie, 1 St John Madder market, Norwich NR2 1DQ was the venue for a "Stag Night" for a group of gentleman. I performed my comedy cabaret show for Jeremy and his best mates at the charming restaurant in Norwich. http://www.theironhouse.co.uk/ I received this email the next day; "...Jerry and I just wanted to say a big thank you again for Saturday night. Jerry tells me that his son Alexander and Jane's 4 boys were still raving about your performance the next morning. And the rest of us didn't take long to get over the fact that the "entertainment" wasn't a stripper once you got started. We had a great night and all went home happy..."
7th October. Three day Expo. More magic for Solartech at the Grand Designs show at the Birmingham NEC. 28th October. Wedding party magic at the Holiday Inn, Northampton, a charming intimate wedding, the adults and children enjoyed the small magic show I put on for them. Later that evening a family Magic show for a Halloween party at The Centre at Mawsley, 9 The Green, Mawsley, Northamptonshire. 30th September. Three day Expo. My job was to draw customer to the exhibition stand of Solartech again, at the Homebuilders show at Earls Court Exhibition centre in London. Hundreds of people came to the stand to see Solartech, and it was my job to use my magic to entertain those that where waiting to be seen by the sales team. 3rd September. The Terminal Building, Shoreham Airport, Shoreham by Sea, West Sussex, BN43 5FF was the unique venue for the surprise 60th birthday party for Dianne Pearce. Her husband hired me as surprise entertainment for her. They had seen me last year another 60th party and called me up to see if I could work my magic again. We all had a great time and I received a nice letter from Frank a few days later "...you were even better than last time and everyone thoroughly enjoyed your act..." It's great to get good feedback. On the 30th August I did a lovely show at a retirement folk's day centre in Bicester, Oxfordshire. A forty five minute cabaret show at 11am in the Morning! They all thoroughly enjoyed it as did I, so much so; in fact we are doing it again in December. 25th August. Believe it or not Christmas Bookings are coming already. If you are having a Christmas Party, you better start booking your entertainment now. You can follow me on Twitter. @carlthemagician. 21st August, An unusual one this one in terms of the venue; The Walled Garden, Basing House, The Street, Old Basing, Basingstoke was hired by a Media company called Amber Fin. Another summer B-B-Q, with bouncy castles, a very very good traditional Punch & Judy, live music in a marquee and me ice breaking with close - up Magic. This is what they said; "Good show - great icebreaker - thank you! Good to meet you and hope we'll cross paths again. All the best, Thelma"
20th August. Despite the quiet summer period when people are on holiday, I have had quite a busy August. Another highlight was preforming an hour of Magic for a small but intimate 21st birthday party dinner at the private home in Brill, near Aylesbury, in Buckinghamshire. 6th August. The Be-Wiser insurance company hired The Weyhill Fayre, Weyhill, Andover, Hampshire for a company summer barbeque for the staff and guests, amongst other attractions including bands, circus performers and bouncy castles, they hired me to be the roving magician. It was a great fin event and with some fantastic reactions to my magic including some W.T.F., moments! 4th August. Didi Pullara's wedding party at the beautiful St Michaels Manor Hotel, Fishpool Street, Saint Albans, Hertfordshire. A small intimate wedding with about 40 guests, I was hired to entertain with close at hand magic during the drinks reception. There was a mixed audience of adults and children and folk of different nationalities, the magic was a great ice breaker, and was received very well. 31st July. Magic show at a family christening party in Cherwell Edge Golf Club, Chacombe, Banbury, this seems popular venue for christenings, this was third one I've done here in as many years. Great crowd I had a very enjoyable show. 23rd July A private party for a family in Chieveley, near Newbury, Berkshire. Celebrating the 40th and 50th birthday's of a couple and their 10th wedding anniversary making that 100! This is what they said; "Hi Carl, Just wanted to thank you again for your magic on Saturday afternoon, you went down a treat and received lots of good comments back from our guests some even asking how wide an area you cover?! I have directed them to your website!! Thanks again Helen"
22nd July, RAF Benson, Magic in the Officers mess, can't say too much, very hush hush you know! 17th July, Entertained the guests and children with magic and comedy at a private Christening lunch in Newbury Berkshire. The client had seen me entertain at another function and booked me on recommendation, which is nice. 10th July, The British Grand Prix. My family magic show and Mix n Mingle close-up magic at the headquarters of Mercedes-Benz Grand Prix Limited, Brackley Northamptonshire. A huge event for the staff and guests of Mercedes-Benz Grand Prix Limited, whilst those that wanted to see the race, I entertained those that didn't! Quite a few of them surprisingly! 9th July, Mix n Mingle close up magic at Monkey Island Hotel in Bray, Near Windsor, Berkshire. I entertained the Sargent's, Officers and guests of the Royal Fusiliers, a lively bunch, great fun. 2nd July, A private 60th Birthday party function in Oxfordshire. I'm in luck once again, working in another old stately home, but this one is now a hotel and business conference centre, set in stunning grounds, Middle Aston House in North Oxfordshire. The family cabaret magic show went down very well, the audience where very nice. 26th June, the weather holds up once again at Wormsley for another magic gig at the Getty Cricket Ground. This venue is truly stunning, and if you ever get a chance to visit or walk the many public footpaths through this private estate, you should take advantage of it, the estate is truly stunning. 25th June, Cliveden again entertaining the queues and the crowds at the famous gardens of the world famous stately home, another beautiful day and I had some great reactions from the children and adults today. 19th June, Another trip to the Getty Estate, Wormsley, to entertain the folks at the Cricket Ground for the Big Group Consultancy, it was a lovely hot summers day, and the mix n mingle magic went down well with the Pimms! 5th June 2011 Another busy week of enquiries and magic shows. I am getting enquires already for December for Christmas parties and company functions. Clients are asking for quotes for close up magic and magic shows! It's not even Midsummer Day yet! On Saturday I provided magical entertainment for a couple of hours on a boat up (or was it down) the River Thames, starting at Runnymede near the Runnymede Hotel. The event was for a private client who was celebrating a significant wedding anniversary, with just 60 guests for dinner on the boat. It was a lovely relaxed party and the guest were good fun and all seemed to enjoy the magic. On Sunday another select family affair for the thirty-tenth birthday party of Kate Adams in Boxford, near Newbury, Berkshire at the Bell Inn. A one hour magic show was what was required by Kate for all the family, children and adults all took part in the show, and a thoroughly enjoyable time was had by all. 31st May 2011 - A busy weekend of birthday parties and weddings, with families, friends, more politicians and a Lord. This Weekend I performed magic at two family parties and a wedding. On Saturday I did a one-hour family magic show for a birthday party in a village hall in Somerton near Bicester in Oxfordshire where there were children and adults of all ages. I'm delighted to say the show was very well received (well I would, wouldn't I!) and everyone joined in with show which was a magical family cabaret with the emphasis on making the adults and children laugh. I included in my act amusing magic for the children and some more sophisticated award-winning magic for the adults. I know that I enjoyed myself, and I am sure that the audience did too. I also did a very similar show at another family party in Camberley, Surrey on Sunday. One of the guests there enjoyed the show so much that she has asked me to perform at another event in July. Then in the afternoon I went to a wedding in Wendover, Buckinghamshire, where I was booked for five hours! I was charged with entertaining the Bride and Groom's guests for the two-hour champagne reception, which was outside and in a marquee. I mixed and mingled with the guests, who included people from Germany, Switzerland, USA, the far North of Scotland and Birmingham. I performed magic for farmers, accountants, lawyers and politicians, and a Peer of the Realm; Geoffrey Howe, Baron Howe of Aberavon, CH, QC, PC; the former Chancellor of the Exchequer and Deputy Prime minister. There was lots of laughter and amazement from the guests, just what was needed for the long drinks reception whilst the Bride and Groom, Bridesmaids and Page boys were having their photographs taken. Then there was an interval for me, because after the wedding breakfast, I performed a 30-minute magic show for the children. This was given as surprise to the children as a gift from the Bride and Groom. The age range was 3 to 13, it's quite a task entertaining children with such a large age difference, but the show was very well received and the kids had a thoroughly good time. Weddings can be a bit dull for children so my show was probably a welcome break for them. 23rd May 2011 - This weekend was a busy one. On Friday I entertained the clients, their guests and visitors of the Mentaur Ltd Day Care Centre in Northampton. I performed mix and mingle close-up magic whilst invitees visited the day centre. The guests included managers and owners of the day centre, local authority employees and the Member of Parliament for Northampton North, Michael Ellis MP. On Saturday evening I had the pleasure of working again for a client that had hired me last year. Phil O'Keefe's 60th birthday was a family affair with about 60 guests at the Banbury House Hotel, Banbury, Oxfordshire. I started with mix and mingle magic at the reception party upstairs whilst guest where arriving and having cocktails. This was a great way to get Phil's party warmed up as some of the guests did not know each other, this type of magic show works well as an "ice breaker". Later when everyone was called down to dinner, I performed close-up magic around the tables, this allows the guest to sit and relax and enjoy some clever, entertaining magic in a more relaxed environment. Phil's guests are a great crowd and we had lot of fun laughter, just what Phil wanted at his 60th birthday party. On Sunday evening I had the honour and pleasure of performing my comedy cabaret magic show for the members and guests of the Zodiac Magical Society at their 65th Birthday party, one of the oldest magic clubs in the world. The Event was held at Drayton Court, West Ealing London. My 30minute show, which is a sit down show in a cabaret style, was well received amongst the other magicians and their families and guests, and we all had a lot of fun. 15th May 20011 - I had the honour, privilege and pleasure of entertaining at the birthday celebrations of one George Critchell and family on Sunday at the Swan Hotel in Streatley, Oxfordshire. A small event of just fifteen close family members having Sunday lunch, the remarkable thing about this party though was that the birthday boy was 100 years old! George is a remarkable man still living in his own home and independently and he still rides his bicycle down to the shops. A fun time was had by all and I really enjoyed entertaining George and his charming family. 11th May 2011 - Blimey! A booking for November already! November 2012 that is! A Diamond wedding anniversary party in Cambridge. Now that's what I call forward planning. 28th April 2011 - It's nearly Royal Wedding day! I'm performing magic at a Street Party in Sutton Courtenay, Oxfordshire, tomorrow. Why don't you join me there? 22nd April 2011 - Happy Easter! 21st April 2011 - I'll be tweeting from now on so follow me on twitter, @carlthemagician. Took part in a course today, very interesting and entertaining course on how to get the most out of twitter for business. 17th April 2011 - Performed magic for the guests at a corporate cricket match at the estate of John Getty in Wormsley for the BIG Group. 9th/10th April 2011 - Outdoor mix and mingle magic, entertaining the crowds and the queues at Cliveden for The National Trust. Entertained over 300 people! 27th March 2011 - Magic at the NEC Homebuilder's Exhbition for Solartech. Attracted a lot of customers for the sales guys to talk to.